We have so many different holidays every year. They are always celebrated merrily with nice decorations to brighten both public and private places. However, once the holidays are over, we are often left with cleaning up these so-many decorations. Some we need to throw away, but many can still be used for the next same holiday season. Rather than buying new decorations every year, why don’t we just keep them tidily until we use them again the next time? It’s also all very easy and cheap. All you need to have is 5 gallon pails in different colors. The following talks about organizing holiday decorations in 5 gallon pails. Each holiday season is normally marked with specific color(s). For example, Christmas is associated with red and green, St. Patrick’s day green, Valentine’s day red and white and Halloween orange and black. 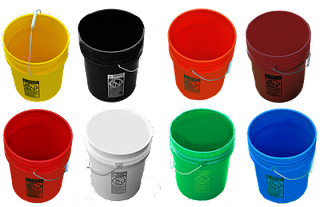 For easy identification of these different holiday decorations, you can color code the 5 gallon buckets with these specific colors. Place the Christmas tree decorations in red and green pails labeled “Christmas.” St. Patrick’s decorations can be piled in this cute Camo green pail. The romantic pink, red and white candles or other Valentine’s Day crafts can go to the red and white buckets. The Halloween masks, centerpieces, bat garlands etc. can be stored in orange and black pails. If you celebrate any other holidays, feel free to code your buckets for each specific special day. Whether it is Halloween, Christmas, Independence Day, etc., we can always try to get more organized towards the end of each celebration. The colorful 5 gallon buckets help a great deal in color-coordinate these holiday goods. 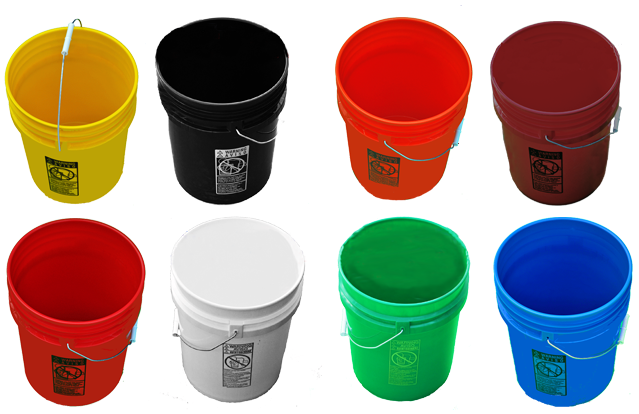 It’s also a great idea to buy a package consisting of each colored bucket to save money. So, are you up to holiday organization throughout the year? Inexpensive 5 gallon buckets are the answer to easy and cheap organization. Most importantly, no more throwing away reusable decorations, which means less money to spend the next holiday!